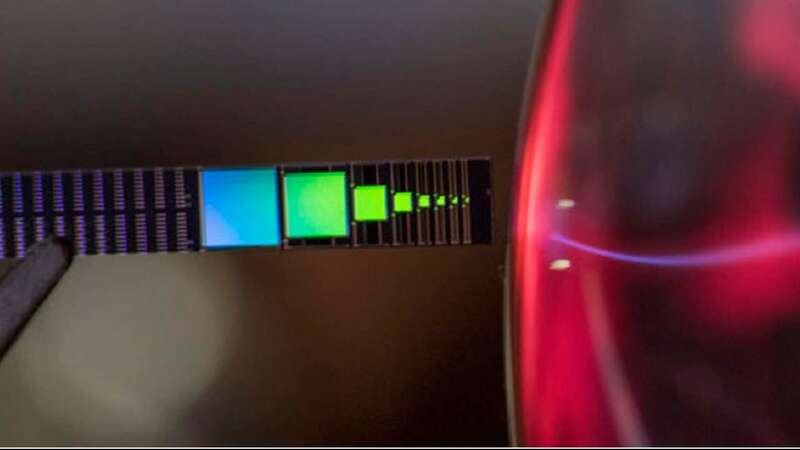 Scientists have developed a tiny silicon-based device that can harness electricity from waste heat and could be used power sensors for space missions which do not get enough direct sunlight. The device is made of common and abundant materials, such as aluminum, silicon and glass combined in very uncommon ways. Smaller than a pinkie nail, the device is about 1/8 inch by 1/8 inch, half as thick as a dime and metallically shiny. The top is aluminum that is etched with stripes roughly 20 times smaller than the width of a human hair. This pattern, though far too small to be seen by eye, serves as an antenna to catch the infrared radiation. Between the aluminum top and the silicon bottom is a very thin layer of silicon dioxide. This layer is about 20 silicon atoms thick, or 16,000 times thinner than a human hair. The patterned and etched aluminum antenna channels the infrared radiation into this thin layer. "We have developed a new method for essentially recovering energy from waste heat," said Paul Davids, a physicist from Sandia National Laboratories in the US. "Car engines produce a lot of heat and that heat is just waste, right? So imagine if you could convert that engine heat into electrical power for a hybrid car. This is the first step in that direction, but much more work needs to be done," said Davids. "In the short term we're looking to make a compact infrared power supply, perhaps to replace radioisotope thermoelectric generators," he said. Called RTGs, the generators are used for such tasks as powering sensors for space missions that do not get enough direct sunlight to power solar panels. The infrared radiation trapped in the silicon dioxide creates very fast electrical oscillations, about 50 trillion times a second. This pushes electrons back and forth between the aluminum and the silicon in an asymmetric manner. This process, called rectification, generates net DC electrical current.